File photo of a rough sleeper walking through Dublin city. IT WAS IN 1992 after years of working trying to help the homeless people of New York City that Dr Sam Tsemberis came up with a new solution to an old problem: give them homes. Tsemberis had found through his work with rough sleepers that the traditional models were not working. “We had all been trained to approach people who were homeless and on the street with an invitation to either a crowded shelter or to a detox or some other form of either treatment or a transitional place to start,” he told TheJournal.ie. “We thought that would prepare them for housing. We thought people needed to be prepared for housing. And it was really that failure that led to thinking we have to try something different. Something that’s more appealing to people. The “something” was to become housing first – a model of care for homeless people that involves giving them homes first thing, and then providing wrap around support for dealing with their other issues. “When we took the time to ask [homeless people] about the direction that they wanted to take, that led very quickly to a place of their own,” said Tsemberis. So all we had to figure out is how to get them there. Dr Tsemberis is in Ireland this week consulting with homelessness charity the Peter McVerry Trust as they plan to extend their own housing first programme to address Ireland’s worsening homelessness crisis. Ireland first signalled a shift away from the traditional “staircase” model of addressing homelessness and towards a housing first approach in the 2011 Programme for Government. The staircase model would involve a homeless person going through a number of steps (maybe getting clean from drugs, completing courses, etc.) before they were allowed transition to a house. Housing first flipped this model on its head with a secure, safe, permanent home with support being the primary goal; and recovery, therapy or whatever else is needed coming after that. It was explicitly contained in policy documents around tackling homelessness from that point on. But a dedicated housing first team only began to work in late-2014 following a successful pilot programme. The project has seen good successes in the US and other countries around the world. Finland adopted a housing first programme in 2008 and has all but eliminated long-term homelessness there. The housing first programme in Dublin is ran by workers from the Peter McVerry trust and Focus Ireland and is financed by the Dublin Regional Housing Executive (DRHE). To date, the programme has resulted in 167 people being housed. PMV Trust has also been pursuing its own solo programme which has resulted in 25 tenancies so far and which it is expanding. These people would have been the most entrenched, longstanding rough sleepers – those who may have been on the streets for years and completely lost touch with the system. For Dr Tsemberis, it is important that this group is housed first under the programme, before moving on to help others. “Everybody’s deserving of a decent affordable place to live. Housing… should be a basic human right – just like healthcare and education,” he said. “So I think it’s a community decision to figure out the priority. I think most communities would agree that someone who’s on the street and vulnerable probably should be housed first. Because you’ve got to start somewhere. It’s not more deserving or less deserving, it’s just a question of who needs it and who’s most at risk if we don’t act. Latest figures for Ireland show that there were 5,222 adults and 3,048 children living in state-funded emergency accommodation in August. 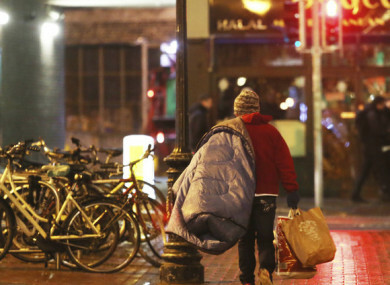 The latest rough sleeper count for Dublin found 161 people sleeping on the streets of the city in April. Homelessness in the country has consistently worsened over the past number of years, as rising house prices and a lack of adequate housing supply have pushed more people out of their homes. For Dr Sam Tsemberis, homelessness is just a symptom of a much larger social issue. “The homeless that we see are the tip of the iceberg of many more profound and difficult to solve social problems,” he said. “For every homeless person on the street there are many, many others that are at risk of homelessness because of some of the structural and economic disparity issues in the country. The rents are rising but the wages are not rising as quickly. All of those kind of issues are what create homelessness. When we’re ending homelessness we’re certainly taking care of a very visible symptom of a much larger problem. But Tsemberis said that it is still a relatively manageable situation in Ireland, and that if the political will was there homelessness could be solved overnight. “I think the good news here is that the numbers of people on the street is actually very small,” he said. “It’s something that can be quickly ended. We don’t need to have street homeless in Dublin. We could end it this year. If we just put our mind to it. And I think that would also then helping the next group in the shelters and people who are coming out of jail homeless. Tsemberis believes that the solution for homelessness has already been identified in the housing first model, but that it relies on the political will and the pressure from citizens to enact it. “When it becomes a public issue. When it becomes a huge public issue the politicians will act,” he said. And if it comes to that there’s a solution at hand to actually take care of it. Email “The man who pioneered a solution to homelessness: Give people homes”. Feedback on “The man who pioneered a solution to homelessness: Give people homes”.